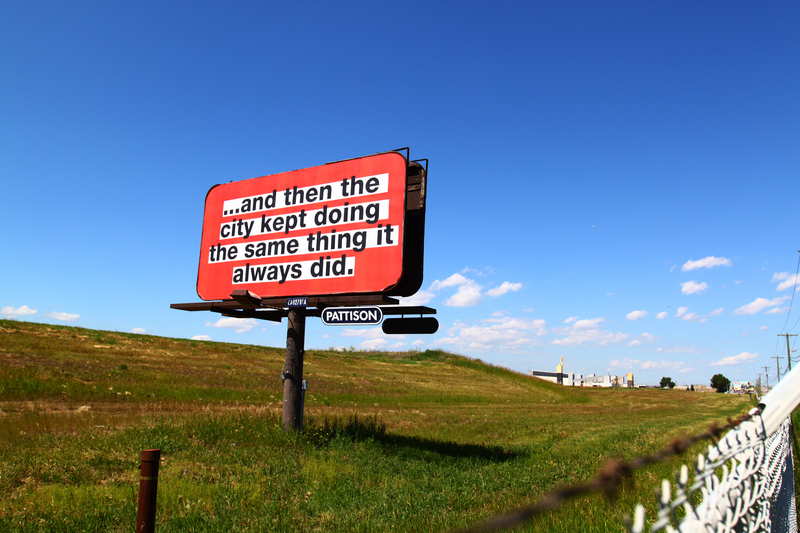 Image: …and then the city (Calgary), made possible with support from Truck ARC. With Broken City Lab, a series of billboards creating a landing point in what seems to be the cyclical nature of cities — hope, failure, bad decisions, nostalgia, construction, sprawl, gentrification, isolation, devotion, etc. The billboards suggested the end of one part of a conversation and the beginning of another, and a way of looking at problems and solutions as a kind of continuum of ideas, rather than points from which to react. As part of Save the City in Windsor, this project was generously supported by the Ontario Arts Council.